A file photo of Australia’s Prime Minister Julia Gillard. 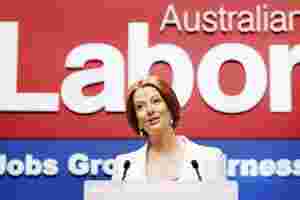 Melbourne: Australia’s ruling Labor party on Sunday backed Prime Minister Julia Gillard’s bold move to overturn a longstanding ban on uranium sale to India, paving the way for removal of a major irritant in bilateral ties. With opponents of the move citing the Fukushima nuclear disaster that rocked Japan following a massive quake and tsunami in March, Gillard, while moving the motion in this regard, said approving the plan would boost trade and enhance Australia’s relationship with India. “We are at the right time in the history of the world to seize a new era of opportunity in this, the Asian century," Gillard said. “We need to make sure that across our regions we have the strongest possible relationships we can, including with the world’s largest democracy, India." She said it was not rational that Australia sells uranium to China but not to India. “We are not a political party that shirks hard decisions," Gillard said. “At this conference we should take a decision in the national interest." She argued that Australia could sell uranium to India without breaching its obligations under the Nuclear non-Proliferation Treaty. Gillard said any agreement to sell uranium to India would include strict safeguards to minimize proliferation risks. “Let’s just face facts here -- our refusal to sell uranium to India is not going to cause India to decide that it will no longer have nuclear weapons," she said. “We can honour the treaty, we can change our platform, we can -- under the most stringent of agreements -- sell uranium to India if we so choose and, delegates, I believe that we should make that choice," Gillard said. The policy change was supported by resources minister Martin Ferguson, defence minister Stephen Smith and South Australian premier Jay Weatherill. However, the decision was opposed by some of the party members including Stephen Conroy, Tanya Plibersek and Peter Garrett. Before the vote on the issue, Garrett said it is too dangerous to sell uranium to India because it has not signed the NPT. Labor Senator Doug Cameron said: “Prime Minister, you are wrong; ministers, you are wrong" in approving the move. “Forget all the arguments about jobs, it’s a sideshow." Federal infrastructure minister Anthony Albanese, who also opposed the move, said, “It is the case that nine months after the Fukushima nuclear disaster is not the time to be expanding our uranium exports." Albanese said the fact that India had not signed the NPT and that nuclear waste was difficult to deal with were “two unresolved issues". “I say that until we have resolved the issues of nuclear proliferation and we have resolved the issue of nuclear waste we should not change our platform to further expand our commitment to the nuclear fuel cycle," he said. Smith, who favoured Gillard’s plan, said any sales would be overseen by international nuclear regulators. “The world changed on this matter in 2008 and 2009 and today the Labor Party needs to change as well," he said. Gillard had announced on 15 November her plans to lift the ban on uranium sale to India, saying “India is our fourth biggest export market, a market worth nearly $16 billion to Australia, with enormous potential to grow as India becomes wealthier." Australia is the world’s third largest supplier of uranium, which contributed more than $750 million to its economy and created more than 4,200 jobs. India is expected to increase its use of nuclear power from the current 3% of electricity generation to 40% by 2050, Gillard had noted while announcing her move. Gillard had also discussed the issue with Prime Minister Manmohan Singh on the sidelines of the East Asia Summit in Bali in Indonesia last month. US President Barack Obama, who visited Australia before attending the East Asia Summit in Bali, had also backed Gillard’s plans to sell uranium to India, saying it “seemed to be compatible with international law and the NPT". “India is a big player and the Australia-India relationship is one that should be cultivated," Obama had said. Meanwhile, Australian Workers’ Union national secretary Paul Howes said the NPT was a “dead-letter treaty". “(It’s) a treaty which has not stopped the proliferation of nuclear weaponry," he said. “I believe the 400 million people who live in India without power deserve the right like we do to have powered homes and schools and hospitals." Australia is home to almost 40% of the world’s known uranium reserves and ships the nuclear fuel to China, Japan, Taiwan and the United States.